Dermatology research, education, organizational medicine, and patient care. Its charge is to further the advancement of all aspects of scientific endeavor in Dermatology. In the execution of its enduring mission, it has been responsible for the development of a number of dermatologic organizations including the American Academy of Dermatology, the Society for Investigative Dermatology, and the American Board of Dermatology. Membership in the ADA is achieved through nomination and election based on meritorious contributions to the field of Medicine and Dermatology. The American Dermatological Association maintains a leadership role in the contemplation and implementation of initiatives that advance the field of Dermatology through research, education, and advocacy. This, in turn, advances the care and treatment of patients with skin disease. As an independent, non-profit, self-funded organization, the American Dermatological Association provides objective analyses and recommendations regarding the complex challenges faced by Dermatology. This is accomplished through stewardship and collaboration with other organizations committed to the ongoing process of advancing the field of Dermatology in the house of medicine. The American Dermatological Association is funded entirely from membership dues. There are no external or commercial sources of support. The year was 1876. Ulysses S. Grant was President of the United States. The United States was celebrating its hundredth birthday with the Centennial Exposition in Philadelphia. The American Medical Association and the International Medical Congress were meeting in Philadelphia. At the meeting of the Section of Practical Medicine of the American Medical Association six physicians; George Henry Fox and L. Duncan Bulkley of New York City, Louis A. Duhring of Philadelphia, I.E. Atkinson of Baltimore, Lunsford P. Yandell, Jr., of Louisville, and Edward Wigglesworth of Boston, decided to form a national society of physicians who have a special interest in dermatology. 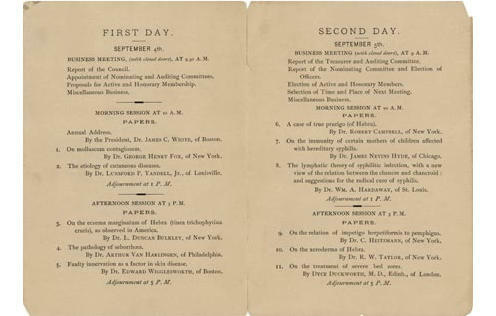 They decided to hold an organization meeting at the University of Pennsylvania in Philadelphia on September 6, 1886, immediately after the close of the Section of Dermatology and Syphilology meeting of the International Medical Congress. An invitation was mailed to approximately fifty physicians in various parts of the United States whose names were known in connection with dermatology. The following men were present at the organization meeting in Philadelphia. The purpose of the association was designated to promote the study of dermatology, with the proviso that the science of syphilology was not to be neglected. This was especially important during the early days of arsenical and penicillin therapy. 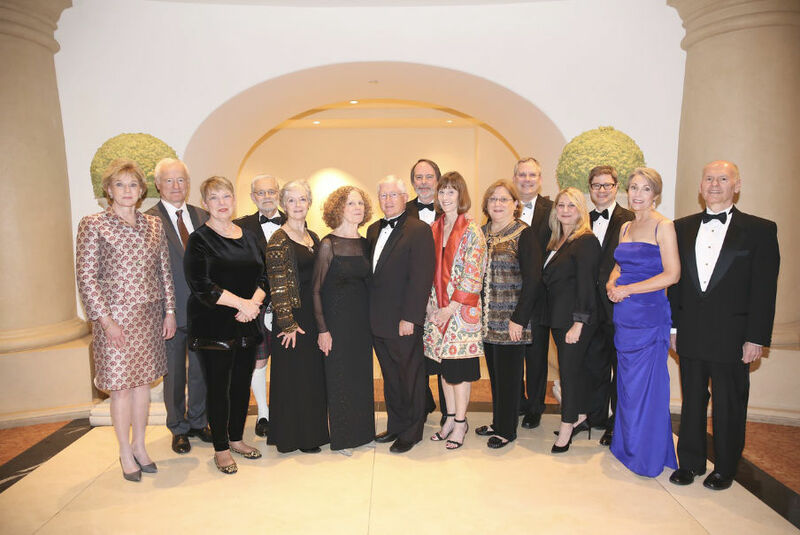 Since the association’s organization, membership has been offered to the teachers, investigators, writers, and leaders of North American dermatology. Membership is by nomination by peers and is a reward for work well done. Throughout its history, the publishing of meeting transactions and papers has been a persistent problem. As a solution, the Journal of Cutaneous and Genito-Urinary Diseases was taken over by the association in 1902. The name was changed to the Journal of Cutaneous Diseases. For years, this periodical was an ideal means of preserving the association’s records. However, publication of the Journal of Cutaneous Diseases was not self-sustaining, and in 1920 the journal was taken over by the American Medical Association. The name was changed to the Archives of Dermatology and Syphilology. 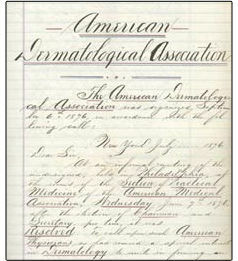 The association, which was the first national dermatological society in the United States, has been responsible for the development of other dermatological organizations. In 1931, the Board of Directors recommended that a committee of three members be established to cooperate with a similar committee from the American Medical Association to formulate plans for a national examining board. In 1934, the bylaws were changed to require that an applicant for membership shall have received a certificate from the American Board of Dermatology and Syphilology. In 1946, the Committee on Education lead many lengthy discussions about increasing opportunities for more training places for dermatology, either in institutions or by preceptorships. 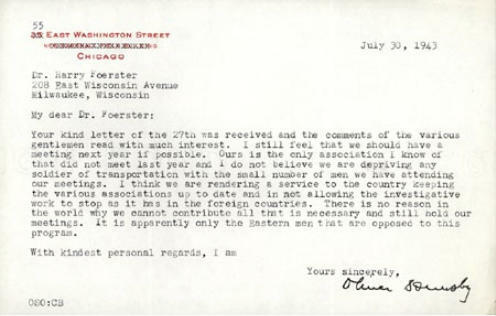 Not until the “Golden” anniversary meeting (1926) were women mentioned. It was voted that women could attend the historical lectures and the dinner. As early as 1904, it was recommended that women should be eligible for membership, but this proposal was tabled for another forty-seven years. 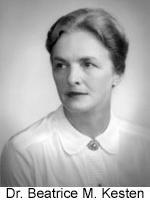 In 1951, the capable and personable Dr. Beatrice M. Kesten was the society’s first woman member. More recently in 2000, Dr. Marie-Louise Johnson became the first woman president of the society. In 1937, Dr. John Stokes announced the proposed formation of a new society for investigative dermatology. Dr. Marion Sulzberger and other leaders of the association recognized the need for meetings and a journal concerned with the reporting of basic research. The proceedings make no mention of the birth of the American Academy of Dermatology and Syphilology. In 1957, the American Dermatological Association Research and Educational Fund, Inc (ADARE) was formed and incorporated. ADARE was organized to promote research in the fields of dermatology. The corporation also receives funds from which either the principal or income is distributed for scientific and educational purposes only. Over the years the fund has financed research grants and lectureships as well as the archiving of the society’s history. For more information on the Society’s Resident and Fellow Research Program, click here. Note: The history of the ADA was extracted in large part from the book, “Centennial History of the American Dermatological Association: 1876-1976” by Dr. Frederick J. Szymanski and published by the ADA. The photos and documents are housed in the ADA Archives and are available to members upon request. Photos and documents stored in the Archives have been generously donated by ADA members. We believe that these initiatives can pivot the ADA to a new era where we can continue our leadership role in the house of medicine. Several projects are underway and findings will be published on the ADA website.